Belgrave Hospital for Children was founded in 1866. 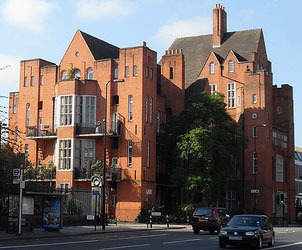 The attractive red-brick Arts & Crafts-style building at 1 Clapham Road was constructed in phases between 1899 and 1926 to a design by Henry Percy Adams and Charles Holden. The hospital used an innovative quasi-cruciform plan, with separate ward wings linked by connecting corridors and bridges, thus ensuring the isolation of any wing during an outbreak of infectious disease. After its abandonment in 1985 by King’s College Hospital (it was amalgamated in 1948) the building fell into disrepair and housed a number of squatters. In the early 1990s, the building was renovated and converted into privately-owned flats. The Removal of the Belgrave Hospital for Children to South London. A meeting of medical men practising in the neighbourhood of the proposed new site of this hospital was held on July 12th at the Clarence Hall, Kennington Park Road, Dr. J. W. Oswald in the chair. Mr. Duke, who had called the meeting, said they were there to hear two gentlemen connected with the hospital speak, and to discuss certain points connected with its coming amongst them. The first question which occurred to him was whether they needed a children’s hospital in that locality, at all. He certainly thought that a few beds where operations could be performed on adults in urgent cases would be, more useful. As general practitioners in the neighbourhood were certain to lose by the establishment of the hospital he thought they should have certain rights guaranteed, such as, opportunities of attending the practice of the hospital and operations, and be eligible for some appointments on the staff. Mr. Soper (Clapham) asked if it was a fact that the hospital had overgrown its limits in its present locality, and the authorities had looked about for a cheap piece of ground and found it here. There was no doubt that the hospital would injure local practitioners, and he maintained that what was really wanted was a small cottage hospital. Dr. Corbett Blades, who had had thirty years’ work as one of the staff of the Royal South London Dispensary, thought a new children’s hospital was not wanted. He enumerated the hospitals and dispensaries in the neighbourhood, and considered them amply sufficient for its wants. Dr. Gibson Bott had been very much surprised to hear at a previous meeting from one of the speakers on behalf of the hospital that no wage limit was necessary, and no inquiry officer need be employed; he considered this the crux of the whole question. for was largely for endowment, and was not all to be spent on the building. Dr. Cautley, another member of the hospital staff, also spoke. He thought the wage limit of 25s. not too high. He explained the proposal for consultation, and feared if no charge were made it would tend to pauperise the patients. One or two such cases came, to the hospital every week at present, some very slight, but others serious cases. Personally he was strongly in favour of an inquiry officer. On the motion of Dr. Howard, seconded by Mr. Swan, it was resolved that those present should form themselves into a committee to watch the progress of the hospital in the interest of general practitioners.